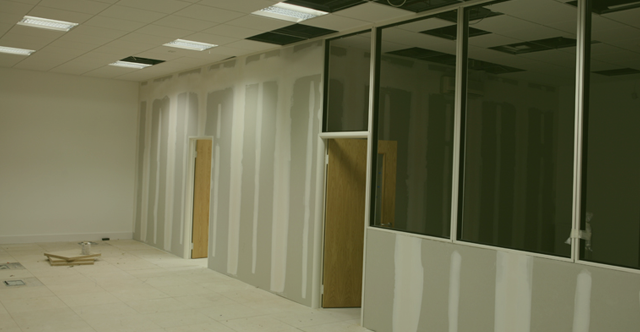 Here at Attcost’e we provide services in dry lining, which is the application of plasterboard to surfaces including timber, metal or masonry through utilising a variety of fixings dependant on the background in place. Dry lining plasterboard is a popular process that has been implemented more frequently over the past years, as it provides a simplistic, clean and far quicker approach in comparison to sand and cement renders and two coat plaster systems. When applying plasterboard to Timber or Metal, the process is called ‘Tacking’ and when applying plasterboard to Masonry, this process is known as ‘Dot and Dab’. Dry lining Masonry involves a little more skill in comparison to drylining Timber and Metal, due to the application of dry lining adhesive that is required. Once the dry lining process has been completed, the subsequent process, taping and jointing, will need completing to ensure the plasterboard has a smooth finish ready for painting. So, what is dry lining walls? Dry lining is a generic term used to explain the application of a dry lining board being affixed to a wall, this is a becoming a more widely used process within the UK as opposed to using a cement or wet plaster finish, allowing for a far speedier installation. Here at Attcost’e when dry lining boards are applied to walls the following benefits are provided; insulation, security, sound proofing, greater flexibility in designing, the ability to change the internal shape of a room and lightweight partitions – resulting in a lighter building with consequent benefits in regards to the building’s foundations. Dry lining wall insulation is far quicker in comparison to plastering, meaning that your premises can be re-vamped in a smaller time scale. If your premises is an older property constructed of solid masonry, you may notice that your solid walls and ceilings allow the heat to flood out, in this scenario; insulated dry lining is an effective way in which to keep your building warm as well as saving energy and money in the long run. Insulated dry lining board has Thermal and Acoustic properties that will help to insulate your solid walls and in-turn enhance comfort whilst reducing your noise levels and carbon footprint. So, if you are in search of dry lining contractors London, then look no further as Attcost’e provide the best in dry lining and insulation. For dry lining London, be sure to contact Attcost’e today for a recommended proven product to suit your requirements perfectly.